Andy Murray vs Federer Live Streams ? You can also tune in here to watch the live action of this match and live streams will be available 1 hour before the Djokovic vs Gasquet match and will place couple of alternative links just before the Murray-Federer clash. Djokovic vs Gasquet is suppose to start at 13:00 local time, while Murray-Federer order of play is listed at 15:00 but if the first semifinal is stretched Federer-Murray game might start a bit later. Because both matches are being played at the centre court. 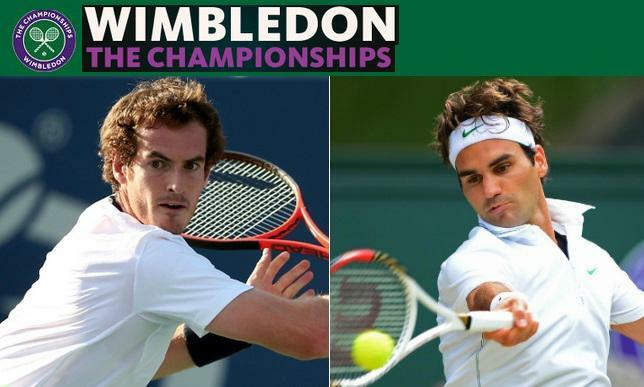 Britons Andy Murray will take on Roger Federer in the second semifinal of 2015 Wimbledon mens singles championship. Andy Murray defeated Vasek Pospisil in the quarter finals to reach semifinal where he will take on former undisputed no.1 tennis player in Roger Federer. This will be the second semifinal and should start after Djokovic vs Richard Gasquet which will be started at 13:00 local london time. The Murray-Federer match will be shown live on BBC2 and on the iplayer available on BBC website. ESPN US will also have the live coverage of this match. Andy Murray and Reger Federer has played 23 times where Federer leads the head to head record with 12 wins one more than Murray’s 11. Last time both of these players meet at the Wimbledon was back in 2012 in singles final where Federer beat Andy Murray in a thrilling 4 set match by [4-6] [7-5] [6-3] [6-4]. Looking at the head to head records in the major finals Murray has lost all three of the finals both men has contested so far which kind of shows that Federer do bring his “A” game in big matches against Murray or its the otherway around with Murray choking under big british expectations. Federer is always there and there about when it comes grand slams and he is just another step away from yet another grand slam final. Roger Federer is not the same as he used to be, he can be bullied put under pressure at times but like they say form is temporary and class is forever. Murray being the younger of the two and might be more hungry should have an advantage here of the home crowd. I am going with a Murray win in straight sets.